Desk traders can see if any orders have been submitted for opposing sides (buy and sell) from their own firm. If this occurs, desk traders may delete those orders and submit them as Cross Orders. Market participants can access their daily summaries of trades per brokerage house for specific contracts. Note: Counterparty data displayed in the Time and Sales window is automatically saved to a file in the ttdatfilestsdata folder. The Market Window and Time and Sales window display counterparty information. For example, the Market Grid provides two optional columns called Bid Member (Bid Mbr) and Ask Member (Ask Mbr) that display counterparty information associated with each order in detailed depth (Market By Order). The cells display either the Alias, the Name (if Alias is blank), or the Numeric ID (if Name is blank). 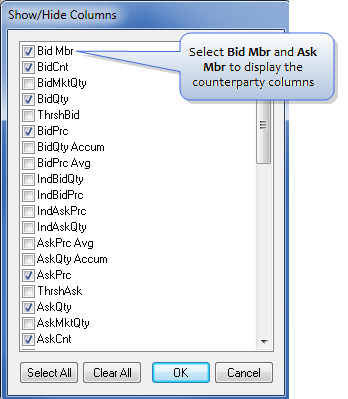 Like other Market Grid columns, Bid Mbr and Ask Mbr may be exposed from the Show/Hide Columns dialog box and repositioned in the Market Grid using drag and drop. Select Bid Mbr and Ask Mbr. Right-click the Grid pane to display the context menu. Select Show/Hide Columns... and Depth. This displays the plunger. Right-click the plunger to display detailed depth (Market By Order) and counterparty at each price level. ID and Name values are provided to X_TRADER from TT User Setup. You can also add IDs on your local workstation before they are published in your environment. Alias is user-defined and can be up to 50 ASCII characters including special characters. Alias and color customizations are preserved on your local workstation when new counterparties are added. The Counterparty Members button, available in the global properties General section allows you to configure BVMF Counterparty IDs. From the Counterparty Members dialog box, you can assign an Alias for the member as well as change the text and background color helping you to quickly identify counterparties. Display the global properties General tab and click Counterparty Members. Click the Text Color check box and click the color bar. Select an existing color from the color palette. Note: You can also use the palette to select a custom color. Click Other, select the custom color that you would like to use and click OK. Select an existing color from the color palette or select a custom color. Note: Customized changes are saved on your local workstation in CounterpartyMembers.dat file located in the ttdatfilesTTCONFIG folder.